Newsletters are available as pdf-version for download in the archive-section, from 1995 to date. 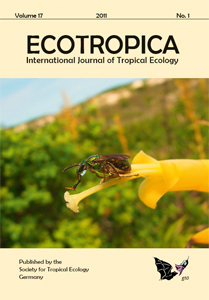 ECOTROPICA is a biannual refereed journal covering all aspects of tropical ecology. Papers reflect results of original research (major papers, short communications) or review important fields in tropical ecology. We offer free full-text pdf-download of papers from backissues older than three years. 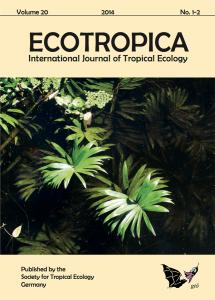 NEW: ECOTROPICA is now covered by Thomson Reuters´ Journal Citation Report (JCR) and Science Citation Index Expanded (SCIE). ECOTROPICA is covered by BIOSIS , UK; CABI Information. Zoological Record, ISI Web of Knowledge. 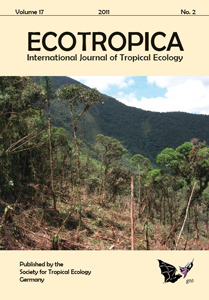 Starting with volume 15 (2009), ECOTROPICA is covered by Thomson Scientific’s JCR (Journal Citation Report) and SCIE (Science Citation Index Expanded). ECOTROPICAL MONOGRAPHS is a now discontinued series of works too long to be considered for publication in ECOTROPICA (>100 pages) or for a number of papers focussing on a specific topic or site. We are currently evaluating alternatives. 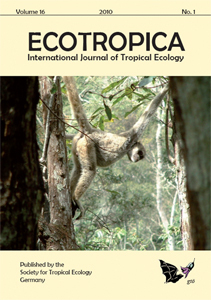 Persons interested in publishing a set of thematically related papers or longer monographs are kindly asked to contact the ECOTROPICA Editor Marco Tschapka prior to sending any manuscripts. As with ECOTROPICA acceptance of individual manuscripts as a whole is based on scientific merit. All manuscripts undergo external peer review. All persons interested to publish in ECOTROPICAL MONOGRAPHS are kindly asked to contact the Editor Marco Tschapka prior to sending any manuscripts.